Today is my first day back to work after the summer holidays and while I had a great time relaxing, reading and spending time with friends, my mind has still been working on creating a million and one ideas from all the inspiration I was surrounded with. So the first step today has been to focus on putting these ideas into a plan. Naturally this got me thinking about how often I hear leaders tell me that they lives are extremely busy and chaotic, that they haven’t really thought about setting time aside to plan. 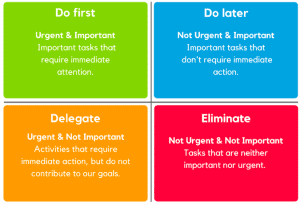 When we don’t have a clear plan of all the things we need to do, and then take time to organise them according to priority and urgency, so that we can have a clear line of sight of our own vision, we can become inefficient and ineffective. And it’s no surprise that if all 100 tasks are seen as urgent and important, then chaos erupts, we become stressed, anxious and exhausted. So this week, let’s start with something small but essential to success. Take some time, half an hour is a good start. Write down all the tasks and meetings and other things you have to do. Then ask yourself, which of these are the most important to achieving my goals, my business goals, my team goals. Then look at the time you spend on the urgent tasks. Can this be delegated? Is there a process that can reduce the urgent tasks in the future? Which of these tasks can I eliminate? Am I so focused on distractions that I am not giving enough time to planning for my important tasks and goals? Until next week, have a purposed week! Your turn: Share some of the ways that you plan. As an Organisational Psychologist, and Executive Coach, I have worked with leaders internationally to build resilience and create strategies to become more effective. I have developed an online platform to connect and grow leaders. You will find mentorship stories from senior leaders, learn how to become more resilient, have access to bite size leadership lessons, and engage with a coach. Please connect if you would like to learn more. Coaching can be defined as a partnering with clients in a thought-provoking and creative process that supports them to identify and take steps that move them between their current reality to where he or she wants to be. The biggest impact of coaching occurs when there is a shift in a person’s thinking, (or aha moments). Shifts in how we perceive the world occur because what we experience changes through the questions that are asked.